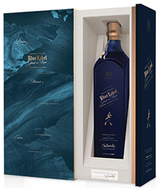 Johnnie Walker Blue Label Ghost and Rare is a rich, velvety smooth blend of eight treasured Scotch Whiskies including three "ghost" whiskies from the silent distilleries of Cambus, Pittyvaich and the Highland Single Malt, Brora, which lies at the heart of this special release bringing a deliciously light peatiness and sophisticated subtle sweetness. Johnnie Walker Master Blender, Dr. Jim Beveridge, has long been fascinated by how whiskies from a small number of iconic distilleries that closed many years ago can bring the extraordinary richness for which Johnnie Walker Blue Label luxury Scotch is known. In crafting Johnnie Walker Blue Label Ghost and Rare, Jim blended the three ghost whiskies with five rare expressions of malt and grains from the existing distilleries of Royal Lochnagar, Clynelish, Glenkinchie, Glenlossie and Cameronbridge. The result is a wonderfully smooth Scotch, with the fruity sweetness of pineapple, rich notes of hazelnut and dark chocolate and a subtle smoky finish.